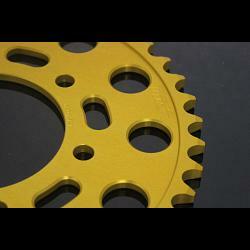 Sprocket, Rear 46T, Aluminium, (Gold) Kawasaki ER-6. Designed and machined in house from super strong 7075 T6 aluminium, and then anodized in gold colour for superior corrosion and abrasion resistance. 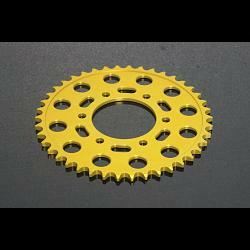 This sprocket is suitable for 520 fitment and can be installed on all model years of the Kawasaki ER-6 and Versys 650.